The best advice I can give someone who is new to woodworking is: Learn to sharpen more than one way. Not all tools can be sharpened using the same method. 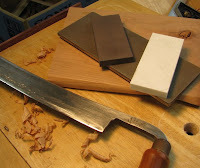 My personal preference is to sharpen chisels and plane blades with Japanese waterstones, carving chisels with a leather strop, gouges with a contoured leather strop or contoured felt wheel chucked in a grinder, moulding plane blades with slipstones, and carving knives with ceramic stones. And there are more methods available than just these. First, sandpaper was used to remove the fine layer of rust that had covered the blade from sitting unused in my basement for 16 years. 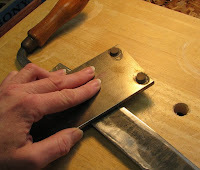 A drawknife cannot easily be sharpened by holding the blade and moving it along a stone, as you would a plane bl ade. Instead, it's easier to keep the drawknife stationary and take the stone to it. So, I used an 80 grit diamond stone to "scrub", in a circular pattern, the flat side of the blade. You can see the swirl marks in the photos. A 600 grit ceram ic stone followed the diamond stone, followed by an 1800 grit ceramic stone. I used ceramic stones because they cut quickly and are small & light, making them easy to hold. I would not use waterstones this way because the blade might gouge the stone. The blade was very dull, so a circular motion was a fast way to remove steel. But I changed to carefully sliding the stones back and forth as the blade became sharp. The same technique was used to sharpen the curved side of the blade, except that I w as careful to maintain the shape of the convex bevel. This drawknife can benefit from a little more sharpening to remove scratch marks, but I took it for a test drive anyhow. It worked great and rounded the edge of a piece of cherry effortlessly. And after 16 years, I'm finally able to put this fun-to-use handtool to the work it deserves. 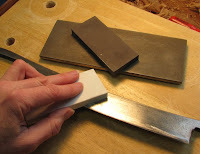 *Mike Dunbar uses sandpaper wrapped around a block of wood to sharpen his drawknives.